Properties in Strawberry Hot Springs average 4.6 out of 5 stars. Charming Cabin in beautiful Downtown Steamboat! BEST LOCATION in OLD TOWN! 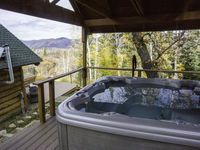 Property 4: Charming Cabin in beautiful Downtown Steamboat! BEST LOCATION in OLD TOWN! Red-tail Round House aka The Snow Globe, on top of a moraine. Property 9: Red-tail Round House aka The Snow Globe, on top of a moraine. Hideaway Haven! Secluded Cabin Nestled Against The Routt National Forest. Property 14: Hideaway Haven! Secluded Cabin Nestled Against The Routt National Forest. Mountain High Chalet - Quintessential Deluxe Chalet - Spectacular Views! Property 18: Mountain High Chalet - Quintessential Deluxe Chalet - Spectacular Views! NEW! 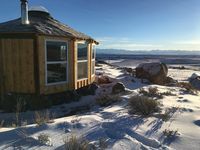 Private Luxury Cabin - 30 Mi. to Steamboat! Property 19: NEW! Private Luxury Cabin - 30 Mi. to Steamboat! This little yurt/hut provided a perfect romantic get away. This place is surrounded by windows and incredible views! The wood burning stove kept us plenty warm at night and it was one of the best places I&rsquo;ve stayed at. I would highly recommend this place to anyone for a night or even a week and the hosts were very accommodating and pleasant to meet. Although this place is Dog friendly, we did not stay with dogs. You can see that dogs have stayed there, but there was no strong odor of dogs. Place is quaint, but beautiful view of Steamboat. A few issues, no salt or pepper, which I'm sure will be rectified for the next guests. Bathroom had no heater, so it was a little chilly in there. There is NO OVEN, only a toaster oven. The hot tub is quite a hike to get to in the winter, might be good to advertise that. Other than that, a very nice stay.